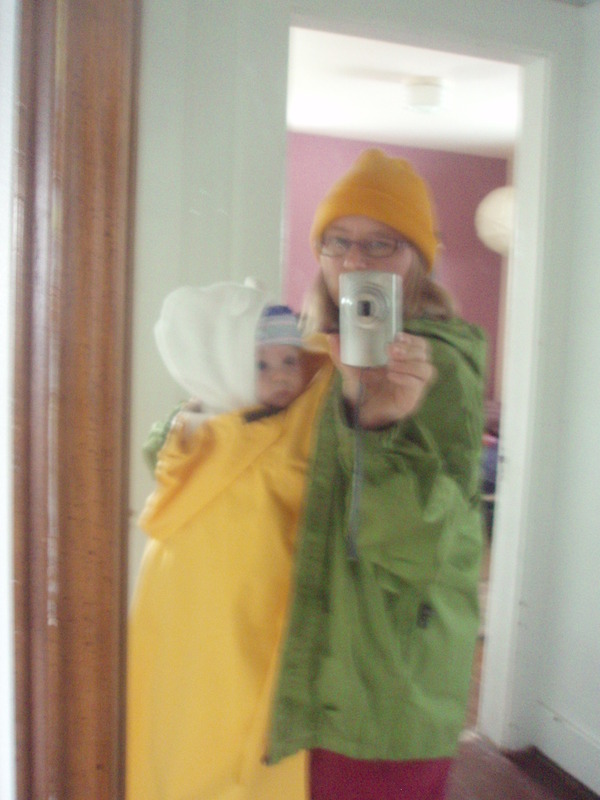 How do you dress to take a kid out in a Cliff Mass worthy storm (or even just an average November afternoon)? Here’s what we’ve found works well, but I’m curious how others manage. Layers: a young baby needs to wear at least 1 layer more than you. She’s not walking or hauling another person around. Minimize: toddlers and older children should have the maximum warmth/waterproofing with the minimum possible number of items. Carry extra clothes and expect to lose socks, hats, rain pants, boots, and other items that you don’t expect to but will somehow lose. Better yet, invest in a small sturdy backpack and have them carry these items (along with snacks, toys, etc–another post). Use your pockets: you might not even need a diaper bag if you have enough pockets. Inside jacket, vest, raincoat–more than enough space for everything we need. I carry a small collapsible shopping bag for bringing home any purchases. Product mentions: the Ergo Baby carrier has great pockets and a built in rain hood. You can also buy additional items that attach to the carrier–a diaper bag & a carry pouch. The Moby is easier to wear when you don’t plan to take the carrier off for a while and it adds a layer of warmth. I found a vest and poncho on Suze’s Kinder , a site that specializes in outerwear for baby wearing. So far, I like the poncho. The vest has arm holes and can be used when carrying baby on the front or back. I like it, but I’m concerned that the zippers might not last long. Invite people over–even when your house is a mess and you have no food. You can always order in. True friends will understand if you ask them to pick up take out or grab a bottle of wine on the way over. When people ask you to bring the baby over, take them up on it. Always say yes to invitations and don’t worry about being a little late, not having a hostess gift or perhaps having not showered. Friends understand. People with kids seem like a logical choice for spending time around your little one, but don’t forget those in your life who don’t have kids in the house. Your life has changed, and maybe it seems all you talk/think about is your child, but spending social time with other adults helps you connect with other parts of your identity. Babies are great ice breakers. We live in Beacon Hill, an incredibly diverse neighborhood currently experiencing a baby boom. There are 3 babies under one year on our block and at least 20 kids under 5 in a half-mile radius. Since the baby was born, we’ve met lots of new friends and had the opportunity to pass around baby clothes and gear. We’ve also met baby sitters and learned survival tips from seasoned parenting veterans. When you see someone with a small child in tow, smile and introduce yourself. Would you like to host a play date or holiday party but you’re overwhelmed by the idea of shopping? Place an order with Amazon Fresh while the menu is fresh on your mind (or monitor) and it will be delivered to your door on the day of your choice. If you plan to be home during the delivery, you can even order beer or wine. I’ve pre-ordered my Thanksgiving items to be delivered the Monday before Thanksgiving, giving me plenty of time to realize what I’ve forgotten. Regular scheduled deliveries have been a life saver for essentials like coffee, baby wipes, and other items we can’t go without. Every Wednesday morning, grocery essentials appear like magic on the porch. For the critters, we have a monthly delivery from Smiley Dog , a friendly local business that delivers high quality pet supplies–never run out of cat litter again! Thinking of holiday gifts? Gift certificates for deliveries make great gifts for new parents and busy people in general. There’s an old saying, “If mama ain’t happy, ain’t no one happy.” Recent research shows this is true: children with depressed mothers do not meet developmental milestones and are at risk of suffering attachment disorders. The best thing you can do for yourself, your relationships, and your child is to get out into the world. Explore new places and bring your baby to your favorite coffee shop or library branch. Integrate this new person into your life and stay connected with your world. Isolation is a major risk factor for depression. In most cultures, multiple generations live together and extended family shares in child rearing. Children are seen, heard, valued and integrated into all aspects of life. This is good for developing baby’s immune system and helps spread the responsibility for socialization across society. Parents and babies receive input about how to get along with the rest of the community. This type of support also helps reduce the risk of postpartum and post adoption depression. Many things can trigger and/or worsen depression, and there are many ways to cope with this debilitating condition. If you or someone you know suffers from depression, seek professional help. Talk to your primary care provider about counseling, medication, and other ways to feel better–for your sake and for the well-being of your entire family.